Selected in the first round (eighth overall) of the 2018 CFL draft and signed on May 14, 2018. 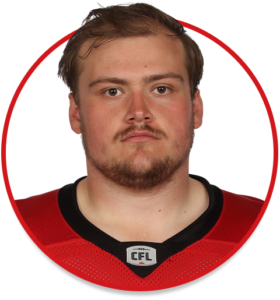 (Calgary) In his rookie season, Sceviour saw action in one game – a Week 13 contest at Edmonton – as a reserve offensive lineman. Sceviour played four seasons at the University of Calgary (2014-17) and dressed in 43 games in his career. He was named a second-team all-Canadian in 2016 and 2017 and helped the Dinos’ offence rush for 1,275 yards in 2017, good for the second-best total in Canada West. Sceviour is an alumnus of Calgary’s Bowness High School. His 22 reps on the bench press at the 2018 CFL draft combine tied for third among all players.